From the opening track to the finale Voo Davis sounds like a cross between Joe Cocker and Roger Chapman fronting an All-star band made up of Levon Helm, Jack Bruce, Duane Allman, Leon Russell and Stefan Grappelli making Midnight Mist tick every box in every category of music that I love. Made on a shoestring the album opens with When I get Back to You and follows with the title track; and I was already suffering from sensory overload; which isn’t to say this is ‘loud Rock’, far from it but Davis and his band create a ‘big sound’ that hits you like an Alabama heatwave and his brand of Sweet Southern Boogie quickly had my toes tapping. Individual songs like Low Hanging Fruit, Music in the Streets and Cajun Sun are so cool they leave you tasting the moonshine and smelling the Magnolia blossom as the music filters out of the speakers; but this album grows in stature from start to finish; peaking in the middle with the awesome Howling Out Your Name and epic Find Me a Blackbone which are both full of slinky and dirty guitar licks and enough Hammond B3 to make your ears nearly explode. 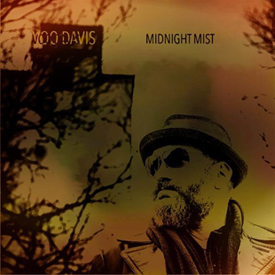 Most versions of Midnight Mist close with the softly beautiful Laughing Out Loud but the Deluxe Edition includes a couple of hot, Blue and righteous tracks called Void and You Wanna Know Why where the rasp in Voo Davis’ voice sounds like he’s actually sorry that the album has come to an end and his guitar solos are straight out of Duane Allman’s hot lick’s book. I’ve now played this album late at night and on sunny days on headphones walking around town and blasting out in the car; and it is a perfect accompaniment for each – I can’t recommend it highly enough.